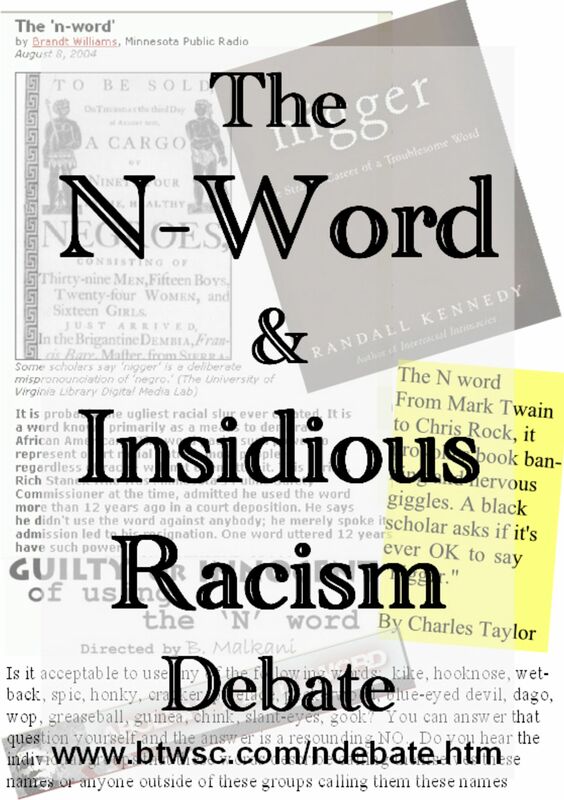 A debate focused on examining the use of the N-word in and outside of black and hip-hop culture, and the effects of insidious racism. As part of its Black History Month programme, BTWSC and BritishBlackMusic.com/Black Music Congress, are organising a debate which puts the use of the N-word within a historical context, by examining its beginnings in 17th century America and questioning the appropriateness of its use in England in the 21st century. Whilst institutional racism has gained currency of late, this debate will also examine the effects of insidious racism. The event kicks off with the screening of 'Guilty Or Innocent Of Using The N Word', a documentary on the use of the N-word among the hip-hop community. Although BTWSC and BBM/BMC are promoting this as an inter-generational event, and have a zero-tolerance for swearing, parents will have to make a decision regarding bringing their children. Youths aged 13-17 are welcome to enter the N-Word competition. All short-listed entrants and their parents/guardians will be invited to an award ceremony which will precede the debate.